For anyone who sews fairly often, sitting down in front of the sewing machine is like sitting down to the dinner table - it's so automatic, we don't even think about it. And once we're seated, the foot/eye/hand coordination is familiar, which leaves us free to think about manipulating the fabric, visualizing the project that's under construction, and enjoying the process of sewing. For someone who has never sewn or doesn't sew a lot, positioning the body in front of the sewing machine can feel awkward, using the foot control while guiding the fabric can be difficult, and remembering the correct sequence of actions can be confusing. There are quite a few things you can do to make operating a sewing machine easier and more comfortable, which will mean sewing is more enjoyable, and you'll probably be more productive. 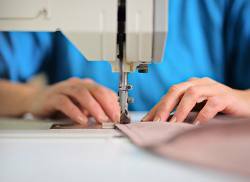 If you've never sewn before, these tips will help you get started - and if you're an experienced sewer, a periodic reassessment is often helpful. Sit directly in front of the sewing machine, not off to one side. Not only will your back thank you, but it's also easier to guide the fabric while operating the machine. Have a comfortable sewing chair that offers support and is a good height in relation to your sewing table. Lots of sewers like using office chairs - the seat can easily be raised and lowered, the back of the chair can be positioned to give your back support, and the wheels make it easy to scoot from machine to machine or to a notions cabinet. Place your foot control pedal so your foot reaches it easily without having to stretch your leg and so it doesn't feel awkward when your foot presses down on it. A small rubber mat under the foot pedal will prevent it from sliding around on the floor - then your foot will always find the pedal in the same place. Tilting the machine can relieve strain on the back, neck, and arms. There are several ergonomic products on the market to achieve the proper tilt (back higher than the front). Using a couple of old-fashioned rubber doorstoppers works, too. Use a sewing table that's large enough so that the project you're sewing is supported. It's awkward (as well as frustrating) to have to reposition your work constantly and struggle to keep it from falling off the table. Provide adequate lighting in your work area. If you sew at night, you might need even more lighting. In addition to specialized sewing lights, study lamps that can be clamped to your sewing table allow you to swivel the lamp so the light shines directly on your work. Mark your machine's throat plate with the seam allowance that you use most frequently. The easier it is for your eyes to find the seam allowance guide, the more accurate and faster your sewing will be. Many throat plates are scored, and sometimes it's even helpful to mark the scored line you use most frequently with a felt-tipped pen. If there's no scoring, a piece of masking tape applied to the throat plate makes a good improvised seam guide. And now, get ready to really enjoy sewing!